Anxiety can differ from person to person. Some people have lots of similar symptoms and others only have a few. It’s very much based on individual perceptions of the situation. There can also be intense fear which can happen suddenly and just seem to take over the body. When this happens a person might notice a mixture of symptoms and these can differ from person to person. Often there can be an underlying cause for anxiety and for others there seems to be no reason at all. Anxiety can be a very personal issue so let me share a personal story with you. Ashley came to see me after struggling for quite a while with anxiety. Ashley told me it felt like there was a new problem every day. She was overthinking every little thing, then worrying about the negative thoughts, then becoming frustrated because it all became a vicious circle. Ashley was getting really upset, crying a lot and had no motivation. She was unable to focus, feeling sick and really tense, particularly in her jaw. She was getting angry and frustrated at having these feelings all the time and just didn’t want to go out – which was totally unlike her. After a brief chat with Ashley we agreed on my 4 Session Anxiety Package and booked the dates into our diaries. 4 sessions is often enough although because each person is different additional sessions are added on if needed. As I began working with Ashley we realised that we would need to add one more session to help Ashley overcome her anxiety. When I met Ashley I could see a glimmer of the bubbly, smiley person that was clearly struggling underneath all this anxiety. She explained that this anxiety had started around the time her younger sister had become ill. It had been quite a long, traumatic time for her and all her family. Towards the end of the first session I guided Ashley into hypnosis and gave her some tools and relaxation tips to take away and practice at home. We discovered, through the use of hypnosis, that during the process of staying strong for her sister and being supportive to her mum, Ashley had hardly cried and kept all feelings locked in, so that she could cope with everything else going on. She also began to recognise that she felt sad, scared and even a bit helpless. I gave Ashley an audio to use at home to enhance the work we did in sessions. We worked on therapeutically releasing those stored up feelings so that they no longer felt trapped inside. 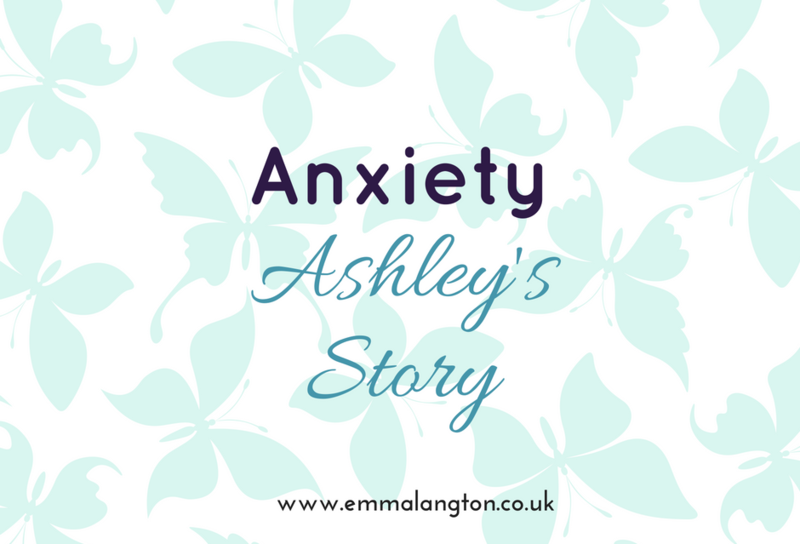 Ashely described her anxiety as feeling like “bubbling butterflies in her tummy”. This release method also helped Ashley to change those feelings and be less trapped with her anxiety. These are tools that can be taken away and continued to be used each day. Anxiety can have a big impact on our bodies and bodily functions too. So we discussed what happens and ways to improve general health and wellbeing on a daily basis. We also worked on de-sensitising the thoughts and feelings which were still vivid in her mind from when her sister was ill. We can’t take away the events but we can make them less painful to remember. We round off the therapy sessions by pulling together all the tools, techniques and progress in a final hypnotherapy session so that these new ways are deeply embedded into the subconscious mind. That way, all the new ways of reacting and responding that we achieve in therapy, become much more automatic and part of everyday life. Do you suffer from anxiety? How does it feel for you? Perhaps you can identify with Ashley’s “bubbling butterflies in her tummy” or perhaps anxiety feels completely different for you. Nice article Emma, anxiety can be such a life crippling challenge for many clients, and when they are given the tools to stop the cycle it can be definetly life changing.